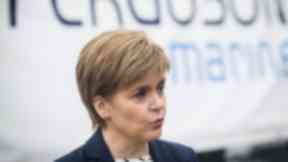 The First Minister says the cash will help mitigate the effects of the new UK Trade Union Act. Nicola Sturgeon has announced a £250,000 fund aimed at helping trade unions mitigate the impact of new UK legislation. The Scottish Government said the money will help unions modernise and respond to reforms brought in by the nationwide Trade Union Act. The legislation, which came into force in May, introduced a threshold for workers voting in strike ballots for action to be legal. Speaking at the Scottish Trades Union Congress (STUC) ministerial bilateral meeting, the First Minister said: “The Scottish Government believes the Trade Union Act, passed by the UK Government, is unnecessary legislation that threatens the capacity of trades unions to deliver the constructive employment relations that underpin a fairer, more inclusive and more successful economy. “There is clear evidence that unionised workplaces have more engaged staff, have a higher level of staff training and a progressive approach to staff well-being. She added: “Our distinct approach, unlike that of the UK Government, is based on partnership working as demonstrated through the establishment of the Fair Work convention and our endorsement of their Fair Work Framework. Working offshore can you really not afford to Join a Trade Union?